Nokia Asha 210 is the latest Nokia Asha device, designed to offer consumers more social experiences at an affordable price. The Nokia Asha 210, available in Single- or Easy Swap Dual-SIM variants. It supports Wi-Fi and ha a dedicated WhatsApp button. 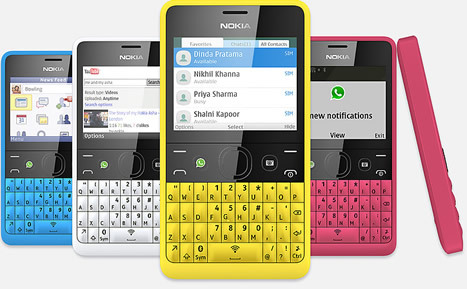 The Nokia Asha 210 has a QWERTY keyboard . So Nokia is celebrating their partnership with WhatsApp and the process WhatsApp is offering their service for free on all Nokia Asha 210 devices . Nokia has introduced a new feature for sharing photos and other content called Slam, which comes built-into the Nokia Asha 210. It works by enabling the transfer of content such as images or videos to another Bluetooth-enabled phone without the need to pair devices. The Nokia Asha 210 also features Nokia Nearby, a web app that lets people discover points of interest such as restaurants, shopping and ATM machines close to their location. 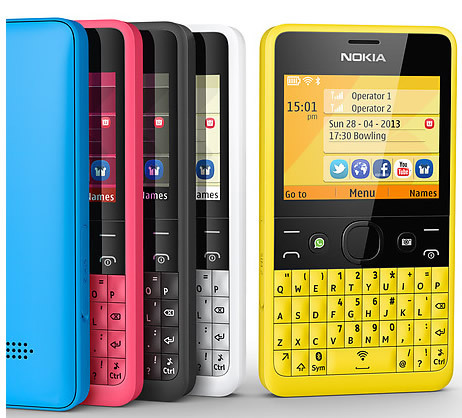 The Nokia Asha 210 is available in yellow, cyan, black, and magenta and white. The estimated retail price for the Nokia Asha 210 is around 72 USD and it is expected to start shipping in the second quarter of 2013.